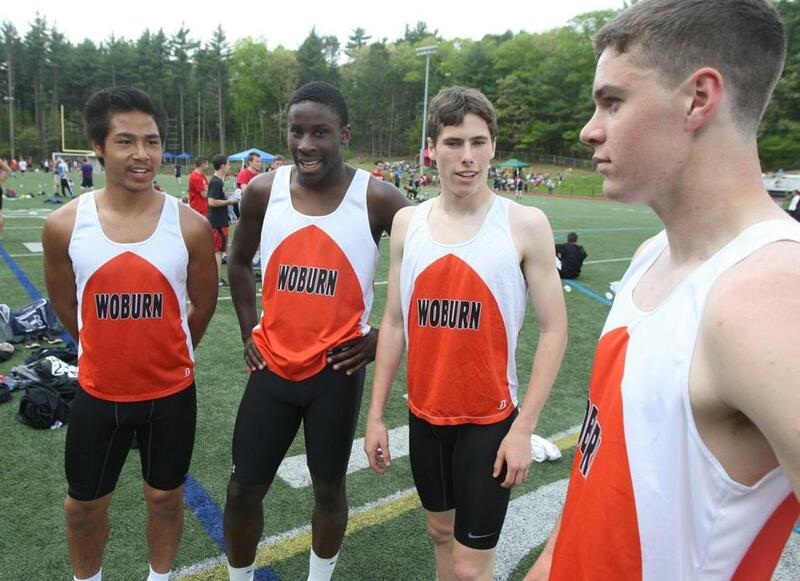 Anthony Nguyen, Preston Gordon, Josh Ercolini, and Chris Jewett, left to right, helped bring a state title to Woburn. Fofano finished his season by winning the decathlon at the National Outdoor Championships. This spring he claimed the Division 1 title in the 110-meter hurdles and javelin. At All-States, he again won the hurdles and was second in the javelin and third in the high jump. After winning the 100 and 200 and anchoring the winning 4x100 relay at the ISL championships, the junior was named the ISL MVP for running events and earned the All-ISL track award. Allen is a dean’s list student who also plays football. Carleo continued to build his legacy as a top miler. The junior placed first at the Division 4 championships (4:24.43), then took nearly 10 seconds off his time at All-States (4:15.42) to once again take home the prize. Colello won the 400-meter hurdles at the Division 1 championships by more than a second with his 54.61 finish. He won the event at All-States in 54.68 and came in third in the 110-meter hurdles in Division 1 (14.57). Connolly won the Division 4 championships in the javelin (186-08), contributing to Weston’s third-place finish. The senior then went on to throw 193-03 at All-States, good for first and almost 7 feet ahead of the runner-up. Couitt was the top high jumper at All-States, leaping 6-8 to take home the top prize. The senior also placed first at the Division 3 championships (6-06) and managed to finish as the runner-up in the 100 meters (11.19). DaCosta took home the Division 4 title in both the long jump (21-1) and the triple jump (44-4). The senior also managed to place second in the triple jump at All-States (46-5.25). Dombrowski dominated the shot put this season, winning the All-State meet with a throw of 56-9. The senior helped lead St. John’s Prep to the Division 1 championship, placing first at the divisional meet (57-4) while also finishing third in the discus. Garmon took the top prize in the 800 meters at the All-State meet (1:52.97) after finishing first at the Division 1 championships by more than a second (1:54.75). His 4 x 400 relay team also placed second in Division 1. Green remained unchallenged in the 200 meters and was also a top finisher in the 100. The junior was the Division 3 champion in the 100 and 200 meters (22.86), and he went on to win All-States with his 21.83 finish in the 200. Hamalian established himself as the state champion of the new pentathlon event this season, winning with a total of 3,231 points at All-States. The senior also took the title at the Division 1 championships, with an even better score of 3,238 points. Hogan was less than two seconds away from breaking Alberto Salazar’s 39-year-old record in the 2-mile at All-States with his 9:01.47 finish. That shaved nearly 13 seconds off his time from the Division 3 championships, where he still took home the title. Jewett established himself as the 400-meter champion at All-States (48.78), contributing to Woburn’s first-place finish overall. The junior also won the Division 2 championships in the 400 (48.92) and took fourth place in the 100 meters. McGee ended his final high school season as the Division 1 champion in the pole vault. His 13-3 finish was a foot and a half longer than the runner-up. The senior also came in sixth at the All-State meet (12-9). Melussi was undefeated in the discus, throwing 165-3 at All-States, almost 10 feet ahead of the next opponent. Melussi also placed first at the Division 1 championships, where he also came in eighth in the shot put. The junior won both the shot put and the discus at the ISTA championships, setting the meet record in the discus. The next week he won the shot and discus at the NEPSTA Division 2 meet and was named the meet MVP. Not only did Saccone finish his season as the state champion in the long jump (22-00.75), but he was a top competitor in several events at the Division 4 championships: runner-up in the long jump, and third in the 400-meter and 110-meter hurdles. Thaller was a consistent top finisher in the 100 meters, placing second in the Division 1 championship and third with a personal-best 10.83 at All-States. The junior also contributed to his 4 x 100 relay team’s third-place finish in Division 1. The crew of Preston Gordon, Anthony Nguyen, Chris Jewett, Marvin Jean, and Nick Maginnis helped the Tanners to the state title. They took first place at All-States (42.48) with a final time not far off the 1995 meet record. They also placed second at the Division 2 Championships in 43.54. Preston Gordon, Anthony Nguyen, Josh Ercolini, and Christopher Jewett contributed to Woburn’s team title with their 4 x 400 relay success. They placed second at the Division 2 championships (3:23.23) before shaving roughly four seconds off their time and taking home the crown at the All-State meet with a time of 3:19.48. Mansfield’s quartet of Jimmy Murphy, Chris Murphy, Mike Duggan, and Jack Crawford snagged the All-State title, setting a meet record (7:49.87) in the process. They cut almost 2 seconds off last year’s record run by Lincoln-Sudbury. Destino has earned back-to-back Northeastern Conference coach of the year awards. He’s been the head coach for the last four years and was an assistant before that. The Fishermen went 6-0 this spring and were the NEC Small champions. A graduate of Woburn High, Fowle led the boys’ track team to Middlesex League and All-State championships. He boats a 67-23 record in 11 years of coaching, and this season the Tanners were 6-0 under his leadership. The three-time Globe Coach of the Year has 32 years of coaching experience. This season he led his alma mater to second place in the Division 3 relays behind state power Bishop Feehan. The New Hampshire grad also coaches indoors. The 2003 All-Scholastic coach of the year has been coaching track for more than 15 years. Norton led Stoneham to a 4-2 record this season and is also the girl’s cross-country coach. Atlantic Coast — Dennis-Yarmouth: Keith Barnatchez, Jacob Pawlina, Arun Rambhadjan, Hiroto Watanabe. Falmouth: Craig Green. Marshfield: Bennett Ford, Steve Foster, Shane Leonard, James Marzelli, Matt Meehan, Justin Patterson, Russell Santos, Zack Stocking, Mike Tautiva. Nauset: Andrew Burke. Plymouth North: Ian Allen, Dimitri Dower, Robert Naidoo. Plymouth South: Tom Giorgio, Drew Guadagno, Dylan Oxsen, Nick Romanowicz. Sandwich: Matt Mullin. Bay State — Braintree: Chris Carson, Jake Flynn. Brookline: Justin Cox, Jeffrey Santos. Dedham: Jack McCorrison. Framingham: Mike McDonald, Eric Mellusi. Milton: Chavinskee Milcent, Anthony Smith. Natick: Jeff Daneault, Lucas Holt, Myles Holt, Mike Maichen, Brandon Thornhill. Needham: Daniel Alpert, Adrian Amaya. Newton North: Nick Fofana, Kevin Joyce, Liam McDade, Jared Prior, Mike Schlichting. Norwood: Thankgod Ugochukwu. Walpole: Bryan Kelleher. Weymouth: Elijuan Diaz, David Harrison, Henry McDonald, Tyler O’Brien, Adrian Radel. Big Three — Brockton: Azariah Boyd, Joao DaSilva, Jonathan Derolus, Ronaldinho Diniz, Eddy Fong, Tyree Gorham, Richard Hector, Hosea Mancortes, Christopher McCaffrey, Stephen McCall, Deion Raper. Durfee: Matthew Baker, Demtruis Barros-Bates, Brad Kilby, Connor Riley, Allison Stasz, Carter Whitty. New Bedford: Marcus Barros, Noah Gioiosa, Raekwon Grace, Irvin Johnson, Chad N’Guia, Wilberto Torres. Boston City — Charlestown: Brandon Scott. Dorchester: Arrik Bell. East Boston: Orlandino Gray. Latin Academy: Kenneth Holman, Handy Laneau. O’Bryant: Brian Donna, George Gomez, Anthony Ruiz, Oussama Sami Amri. South Boston: J-Suan Bastien, Jose Pina, Dewayne Rogers, Garrette Stultz. West Roxbury: Adrian Higgins. Cape Ann — Newburyport: Nick Carleo. Catholic Central — Archbishop Williams: Ben Hamilton. Austin Prep: Joe Connolly. Bishop Fenwick: John Blanchard, Myles Connors, Devin Graham, Colin Norton, Mary Pasquale, Mitch Rivers. Cardinal Spellman: Ramyrge Alexis, Fred Dauphin, Lesley Decembre, Ben Gordon, Rick Jasper, Alex MacMillan, John Edward Sagun, Samir Williams. Marian: Nick Seymour. Matignon: Matt White. St. Joseph’s Prep: Chunkai Wong. St. Mary’s: Mike Cerulli, Cullen Coyle, Andrew DiMaiti, Carol DiMaiti, Tony Mwangi. Catholic Conference — BC High: Ismail Asongwed, William Biggs, Tyler Gomes, Matt Hailey, Marco King, Sean Malone, Justin Marcantonio, AJ Mastrocola, Jimmy O’Donnell, Jordan Samuels, Francisco Tavares. St. John’s Prep: Evan Dombrowski, Josh Hubbell, John Long, Joe Luongo, Mike Mejias, Josh Raposa, Tighe Robinson. Xaverian: Terenze Coleman, Lucas Taxter. Dual County — Acton-Boxborough: Matt Dutton, Henry Grover, Peter Murphy, Will Tejeda, Jeremy Thaller, Ben Vitale, Jimmy Wang. Bedford: Alex Avakian, Jamal McCabe. Concord-Carlisle: Eli Decker, Josh Elwood, Zach Munn, Karl Nyholm, Thomas Ratcliffe, Cole Winstanley. Lincoln-Sudbury: Ben Colello, Esteafan Jack, Josh Kerber, Thomas Phillips, Nick Virkler, Otto Zaccardo. Newton South: Philip Batler, David Berman, Omri Cohen, Anthony DeNitto, Jake Epstein, Ryan Kim, Jamyre Soberanis. Waltham: Brendan Bonadio, Andrew Brenner, Roger LaCroix, Mike Sargavakian. Wayland: Eli Bucher, Cameron Haines, Bennett Keyes, Paul Longnecker. Westford: Tim Breen, Liam Donaher, Kyle Dutton, Thomas Jacobsen, Dillon McGee, Kevin Pawlak, Cody Trudel. Weston: Maurice Blake, Josh Breneville, Andrew Connolly, Lucas Cramer, Collins Ebozue, James Freeman, Jeffrey Ivery-Mallard, Matt Keefe. Eastern Athletic — Bishop Feehan: Matthew Caine, Matthew Danosky, Isaiah Douglas, Mitchell Hanwell, Patrick Hodge, Devon Jolin, Ian Kelly, Tyler Long, Joshua Macari, Brendan Morrissey, Colin Persechini, Ryan Poholek, Stephen Scala, Nicholas Vitorina. Bishop Stang: Nick Caswell, Jeffrey Chicca, Garret Morris. Coyle & Cassidy: Tanner Costa, Scott McClusky, Daniel McSolla. Martha’s Vineyard: Jere Alley-Tartar, Joe Turney. Somerset Berkley: Adam Couitt, Gavin Hyburg, Justin Le. Greater Boston — Cambridge: Esu Alemseged, Shaquille Anderson, Muna Anosike, Daniel Aschale, Pharoah Jackson, Joey Kozlowski, Wilkerson Pierre, Michael Scarlett, Christopher Shimizu, Sam Stubbs, Dashaun Velez. Everett: Lorentz Etienne, Jason Hansen. Malden: Cluade Bonnett, Nahom Ghile, Daniel Gould, David Kibazo, Julien Kindolphe, Isaac Mukala, Richard Mulo, Mark Ortiz, Chris Voltaire. Medford: Patrick Coughlin, Jose Lopes. Somerville: Carls Alphonse, Joao Baptista, Nigel Baugh, Marcello Brociner, Demar Champman, Travis Dolcine, Cidjud Felix, Paulo Guedes, Andre James, Steven Lamisiere, Saragrace Magre, Odmark Ozit. Hockomock — Franklin: Cody Williamson. King Philip: John Berdos. Mansfield: Curtis Boisvert, Matthew Bukuras, James Cooney, Jack Crawford, Mike Duggan, Oliver Erickson, Dean Jenssen, Brendan Keady, Brendan LoDico, Chris Murphy, Jimmy Murphy, Josh Ordonez, Dan Romano, Miguel Villar Perez. North Attleborough: Nathan Adeyemi, Ryan Croke, Ian Flanagan, Sean Gimler, Jacob McKillon, Will Reissfelder. Oliver Ames: Doug MacDonald, Isaiah Matier, Dan Moverman, Emanuel Simeon, Cameron Williamson. Sharon: Adrian Lingo, Adam Selsman. Stoughton: Lennox Green, David Lockhart, Kevin McDonald. Taunton: Andrew Doherty, Lherief Kenku. ISL — Belmont Hill: Michael Fries, Paul Malloy, Sultan Olusekun, Harrison Porter, Lucas Ribeiro. Middlesex: Viraj Deokar, Garrett O’Toole. Milton Academy: Jeffrey Brown, Kevin Lee, Chris Lewis. Roxbury Latin: Joey Mullen. St. George’s: Jonathan Lumley. Thayer: Jordan Allen, James Ferrera, Alim Ibrahim, Jake Marcelino, Sean O’Connor. Mayflower — Bishop Connolly: John Goncalo. Bristol-Plymouth: Elijah Jones. Diman: Alex Lastra, Lacey Perry, Aaron Reed-Coward, Raphael Richards. Holbrook: Patrice Haney. Southeastern: Kenny Bernadin, Robert DeAndrade, Francisco Dejesus, Rodney Dukes, Aaron Major, Jeffrey Pierre, Fernando Quade, Louis Skens. Tri-County: Jack Sturtevant. West Bridgewater: Emma Bedard, David Church, Adam Petti, Cameron Shamey. Merrimack Valley — Andover: Sean Caveney, Hamza Naveed, Sebastian Silveira, Joseph Vetere. Billerica: P.J. Garmon. Central Catholic: D’Andre Drummond-Mayrie, Noah Joyce, Stephen Sullivan, Dan Wilson. Dracut: Tyler Bassett, Ryan Kerrigan. Haverhill: Dozie Onwuka. Lawrence: Jose Adams, Bryan Morales. Lowell: John Abraham, Larry Carney, Michael Holder, Randy Nong. Methuen: John St. Hilaire. North Andover: Yanni Falaras, Jason Rice, Joseph Staudt. Tewksbury: Eddie Matovu. Middlesex (Freedom) — Burlington: Matt Ackerman, Yash Bhalla, Paul Hogan, Matt Martin, Christian Morneweck, Kevin O’Connor, Chris Pappas, Jerry Ramirez, Colin Rapaso, Dan Rooney, Eric Salina, Rebecca Salina, Eddie Stanton, Tim Sunnerberg, Angel Vargas. Melrose: Will Caffey, Christian Gentile, Elizabeth Hirsch. Stoneham: David Bergin, Joe Brown, Ray Lanzillo, Jimmy O’Brien, Dylan Owens, Guy Wynter. Wakefield: Will Bergendahl, Sarah Buckley, Jackson Gallagher, Ben Joly, Anthony Lawson, Aaron Lucci, Armin Palic, Ian Ritchie, Bridget Rollins. Watertown: Brian DallaCosta, James Garbier, Daniel Shin. Wilmington: Joe Gaudreau, Eli Jennings, Steve Layon, James O’Regan, Jon Weaver. Middlesex (Liberty) — Arlington: Shaq Atkins, Andrew Peterson. Belmont: Max Jones, Ari Silverfine, Thomas Wasserman, Marley Williams. Lexington: Quinten Clark, Jake Douvas, Michael Hunter, Ethan Isaacson, Ben Jacobson, John Lahiff, Zack Manickas-Hill, Thomas O’Donoghue. Reading: Tristan Barros, Matt Dynan, Tyler Greco, Justin Halley, Dorian Johnson, Brian Kraft, Aaron LaLecheur, Eric Seferian. Winchester: Jacob Zuch. Woburn: Chris Burns, Josh Ercolini, Preston Gordon, Marvin Jean, Chris Jewett, Nick Maginnis, Rob Maracayo, Kawai Marin, Elijah Mawejje, Anthony Nguyen, Randy Parciero, Dennis Peary. Old Colony — Barnstable: Tanner Banks, Colton Bergal, Malique Dickerson-Pells, Nick Johnson, Alex Napolitan. Bridgewater-Raynham: Abu Ceesay, Kyle Dinunno, Mark Hamalian, Lukas Hanson, Elijah Hernandez, Trey Sheridan. Dartmouth: Ethan Biron, Stephen Cabral, Evan Davis, Chris Martin, Logan Patenaude, Tim Smith. Patriot — Randolph: Evandro DaCosta. South Coast — Old Rochester: Kevin Saccone. Tri-Valley — Bellingham: Wesley Kudirka, Isaiah Rodrigues, Dan Schmith, Dereck Stone. Dover-Sherborn: Dan Carroll, Sam Gabranski. Holliston: Logan Cotto. Medfield: Mike Colivas, Ian Robertson, Sean Robertson, Austin Scola, Gordon White. Norton: Kevin O’Leary, Cam Stalters. Westwood: Ryan DeMarinis, Trevor Holbrook.